Growing up, I was a serious news junkie and always felt a sympathy for the Palestinians as an underdog and just out of an innate sense of justice. After the collapse of President Clinton’s last ditch peace initiative, the Ariel Sharon years, President George W. Bush’s ineffectual policy of the last eight years, and incessant coverage and outrage from the Muslim community on the issue to the exclusion of other issues, I had become disillusioned with the Israel/Palestine issue. 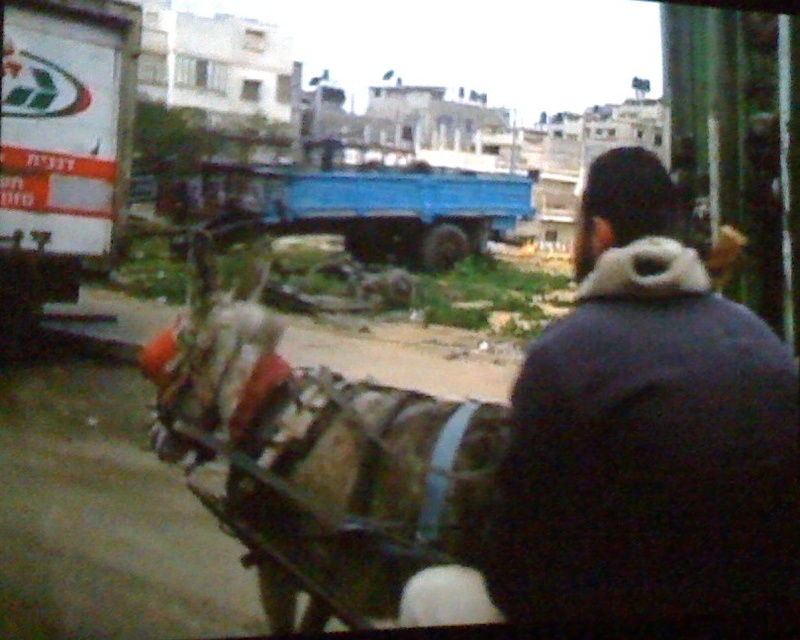 So it was with some Gaza-fatigue trepidation that I ventured out to watch a short film shot by Rep. Ellison and his colleague Rep. Brian Baird on their last trip in February to Gaza at the Capitol building in Washington DC. There are links to the film on Ellison’s website and some extended interviews. 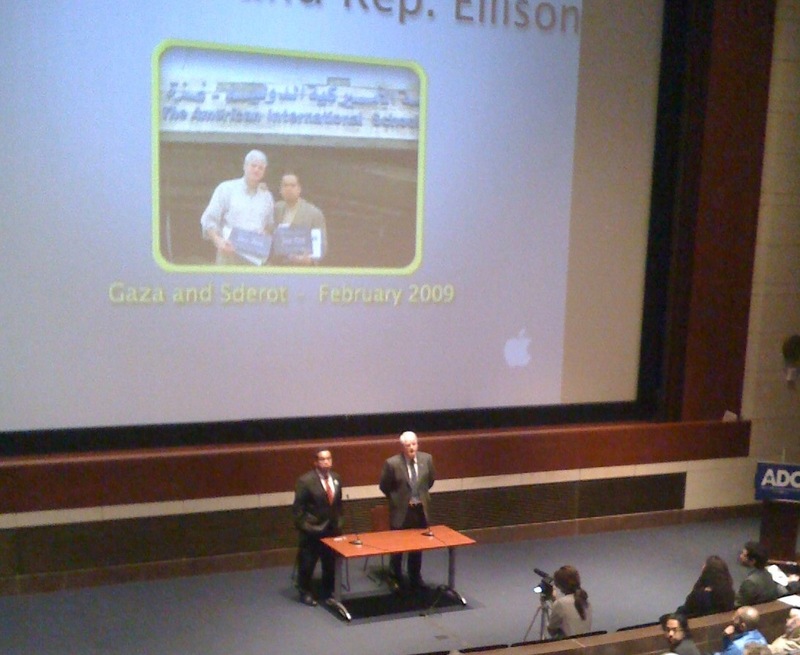 Rep. Keith Ellison began his opening remarks with a couple of St. Patrick’s Day remarks and references and then quickly moved to the topic of Gaza by saying three times, “Open up the Crossings!” Ellison also remarked that having the crossings closed and the ensuing humanitarian crisis was not the will of the American people and that it undermined both American and Israel’s own security. He also emphatically stated that settlement expansion must halt immediately. He mentioned that while he and Rep. Baird were processed through the Erez Crossing very quickly he noticed German relief workers waiting at the crossing in the morning and when the Congressmen returned in the afternoon, the relief workers were still waiting to get through the crossing. Ellison mentioned that while the Palestinians are not starving, severe restrictions have been placed to limit which goods are allowed to enter the Gaza Strip. Cooking oil and rice are allowed while macaroni and lentils are on the banned list. He asked a senior Israeli official about the restrictions and the official said he did not know specifically about the macaroni and lentils restriction but that he would look into it and that the policy of the Israeli government was to put the Palestinians in Gaza “on a diet”. Vehicle fuel is also excluded so that both Reps. saw a lot of animal-pulled carts on the streets. Ellison and Baird also visited Sderot, an Israeli settlement, which is less than mile from Gaza, and bears the brunt of rocket fire from Gaza. Ellison mentioned that we should not “pooh pooh or try to minimize the terrifying existence” and fear of rocket fire that is experienced by the people of Sderot nor of Gaza. And that the fighting and rocket fire is having a huge psychological impact on the children on both sides of the conflict. Ellison emphasized that while there are well-funded constituencies to stand up for rights of either the Israelis or for the Palestinians that there is a great need for a middle way, a constituency to stand up for a “just peace” so that the politicians in Congress feel they are able to advocate their conscience more freely and to help reduce the influence of powerful interest groups. Rep. Baird said that he believed in exchange for peace and land that the Arab nations should be willing to extend more than just a bare minimum of diplomatic recognition. Mauri Saalakhan of the Peace and Justice Foundation referenced Washington’s Farewell Address where he warned of the evils that could result from having an alliance like the one the United States presently has with the state of Israel and asked what the response had been from the Ellison and Baird’s colleagues in Congress to their trip to Gaza. 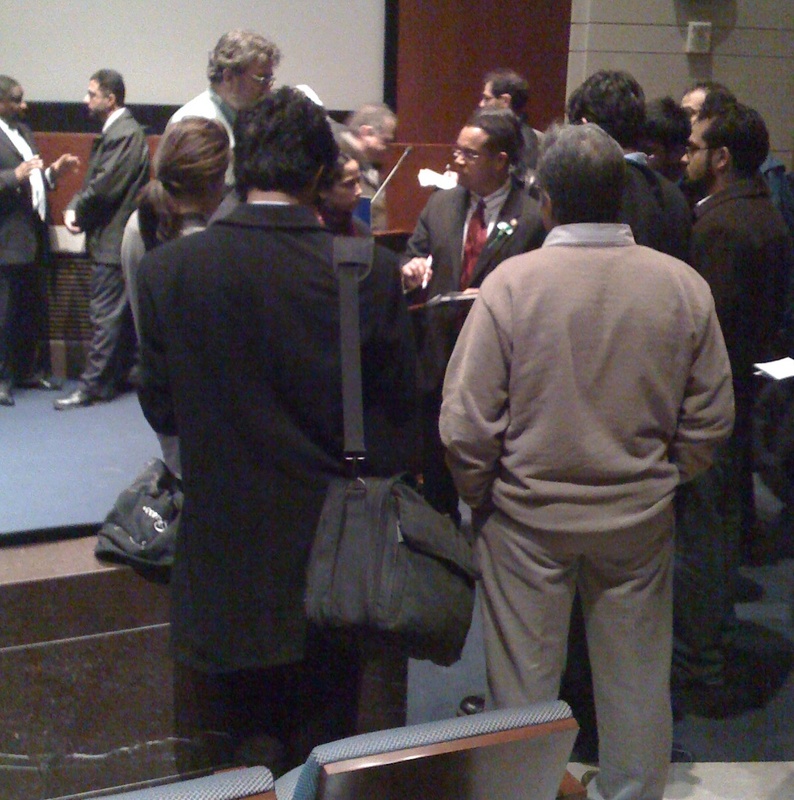 Ellison said that there have been many positive and fruitful discussions, that many in Congress are aware of the situation and the concerns at stake and that if there was a more vocal and active grassroots movement and constituency advocating for a just peace and resolution to the Palestinian/Israeli issue that more politicians and lawmakers would speak their minds and vote in a way that doesn’t just appease the status quo. He referenced two examples. The first, in response to a question about why Congress doesn’t make Israeli military aid contingent upon the Israelis not using the money and weaponry against the Palestinians. Ellison mentioned that a vote in favor of this condition would be politically dangerous and a form of political suicide from those outside very liberal districts. All politicians want to be re-elected so in the absence of a middle constituency between the extremes such a bill would not get far in Congress. And second, Ellison mentioned the vote initiated by Rep. Howard Berman, the Chairman of the Foreign Affairs Committee in the middle of the most recent conflict in Gaza to affirm Israel’s right to defend itself. Both Baird and Ellison voted present “not as a duck but as a matter of principle.” Ellison said the bill came in on Thursday and the ink was hardly dry and no one had time to read it before the vote came up on Friday. Ellison said that the timing was poor as this was in the midst of the latest conflagration, that these bills are simply ideological and do nothing to help further the cause of either side. He said, his “main thing is to build some good will and open minds” and that many in Congress are curious about the conflict and not to assume that because someone may have voted this way or that way or comes from a particular background that you know his or her conscience. Ellison then said, “If someone is not bold and brave enough for you, remember that moving this ship of state takes care and caution” and that we should look to “build a constituency and not just tear down. Muslims denounced me, but your angry denunciations won’t help feed one Gazan child.” Ellison believes in building broad-based support, “to work with people, to find a way forward” to make progress on the issues that are important to him and does not see it as his job to denounce and tear down people and institutions. To emphasize this point, Ellison mentioned that the blueberry muffin is the state muffin of Minnesota. The blueberry farmers of Minnesota advocated and lobbied their state representatives to win a vote to make the blueberry muffin the state muffin and they were successful, so who is willing to build a coalition to move past the status quo toward a just peace? Dr Nasser, the Director of the Augusta Victoria Hospital in East Jerusalem also spoke at the event. Dr. Nasser mentioned that although medical workers have passes, which enable them to move around, many patients still face severe restrictions and that it is “nearly impossible for patients to cross into East Jerusalem.” Before a patient can seek treatment in East Jerusalem they must obtain a permit from an Israeli office and that the quickest permits take a minimum of 10 days to obtain. Dr. Nasser said that there were no EMS services and no first-responders due to the restrictions on movement. One Anglican woman in the audience also mentioned that Palestinian Christians are also affected by the movement restrictions and that last year some churches were not able to hold Easter services because the priests were not allowed through the crossings. Highlighting the difficulties Palestinian Christians also face may be one way to build bridges to form a larger constituency in this country to provide the space and support necessary for our elected officials to advocate for a more just resolution of the conflict. One often overlooked issue in this border conflict is that the Egyptians also have closed the Rafah crossing although they did allow doctors through during the latest conflagration. So that it is not just the Israelis isolating and enforcing restrictions on the Palestinians, it is also the Egyptians. Next Next post: Muslim Link: Breaking the Ranks or Peaceful Protest?